We’re finally greeted by a colorful version of the opening, after an entire arc of b&w somberness; as it turns out, it was meant to hide that a certain instrument shown wasn’t Kumiko’s euphonium but Asuka’s silver one… which makes a lot more sense considering the flow of the sequence anyway. I’m not sure the gimmick was justified for this reason alone, but it’ll be a nice surprise for some people nonetheless. The episode follows up on this idea of brightening up by giving the series a goofier tone than it’s ever had; this is an earned rest after last week’s tense performance, which makes the silliness easy to appreciate even if this is far from the show’s forte. And hey, fans can now joke about continuity in the Yamadaverse. 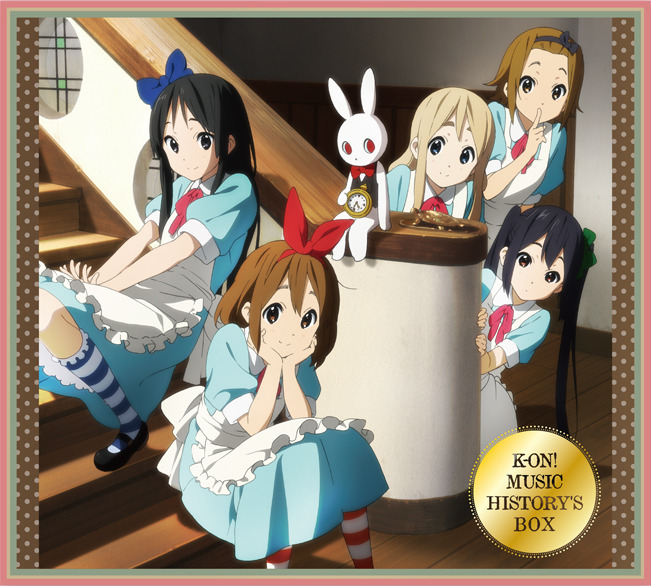 The episode isn’t quite as bustling with life as the studio’s best depictions of school festivals, but it works as a series of amusing set-ups for light-hearted gags featuring the members of the band. This kind of material is a very natural fit for Eisaku Kawanami, the director and storyboarder; he was trained for those roles and eventually had his proper debut during Nichijou, and the first project where he had a high degree of responsibility was Chuu2Koi. For rather obvious reasons then, his comedic timing and whimsical touch are integral to his personality as director. It’s a funny coincidence to see him in charge of a student’s haunted house scene again – something he had already done during Tamako Market, in episode 6 as well. Sadly the sequence itself is rather disjointed and doesn’t really seem to fit, plus it lacks the excellent background animation cuts that Tamako’s had. The traffic lights change as the weather does, signaling the beginning of what might as well be an entirely different episode. One that’s stronger and notoriously more Euphonium, as far as I’m concerned. If the first segment is a mixed bag with funny moments, this second one hits it out of the park pretty consistently. Two narrative threads that have been rearing their heads for a long time finally take the spotlight: Kumiko’s nasty domestic situation due to her older sister’s issues, and Asuka’s still unclear personal problems. Our reliable protagonist deals with this awkward position… by more or less running away, like the teenager she is. At this point Kawanami gets a lot more personal with the camera, bringing us closer to Kumiko’s point of view to the point of featuring a handful of first person shots that really stand out. It’s quite the contrast with the detached view of the early comedic scenes, and part of what makes this portion of the episode so effective. Can’t say I expected this great moody piece to follow up the first half of the episode. 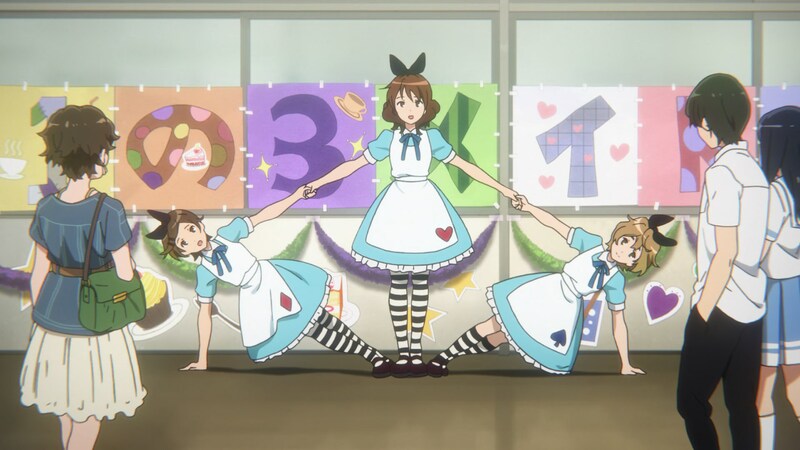 I struggle to come up with any complaints about his work here, aside from one weirdly edited sequence around the end with friends warping to Kumiko’s side and the usual characters as in-world elements approach ditched. Aside from that, everything that slightly bothers me about the episode and the series at this point is more general: TV anime’s inherently inelegant need of flashbacks – particularly required for events from season 1, but still bothersome – and the lack of cohesion the first season had. Going from adapting one novel to a sequel covering two books is quite the change, and even though the content itself is at least on par with the original series, the focus isn’t as tight; having the room to adapt a single story and fill it with lots of original content where required seems to fit the staff’s particular talents better. Being a few steps away from perfection is an issue most shows would love to have though, and I’m aware that those things don’t really bother most viewers. 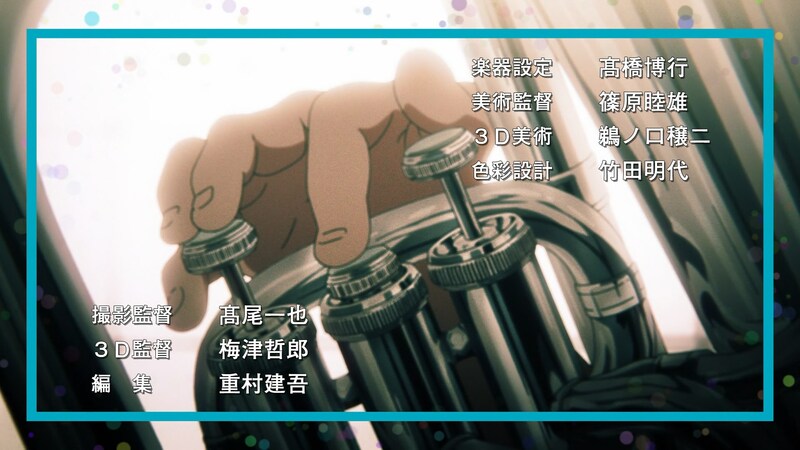 The presence of Miku Kadowaki as animation director despite having a show coming up just next season confirms that Kayo Hikiyama is taking a break from that role – both of them are Animation DO supervisors, and trusting the obviously busy Kadowaki over Hikiyama yet again definitely tells us that the latter is currently not part of the animation director rotation. That can be due to an upcoming project, to make way for the newer generations, or simply because she’s more needed on the animation front at the moment. She did show up as key animator after all, and being credited alongside the studio’s ace Tatsuya Sato seems to imply she’s still doing important work. 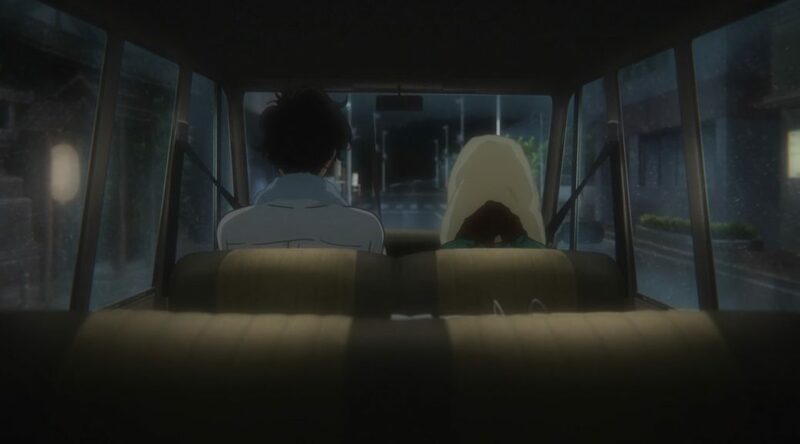 The reliable Kazumi Ikeda was chosen to help polish up the episode instead, and Hiroyuki Takahashi mostly got to rest as instrument animation director… though he might have had to supervise Taki’s appropriately dorky car – an old Citroen Ami by the looks of it – since that’s still mechanical animation supervision duties. Not that it was a particularly demanding job for animation directors in general, of course. It feels like this was the lowest priority episode when it comes to production muscle, the first half in particular. The lack of strict corrections led to rougher drawings but also to more key animator voices leaking through during the first segment, which happened to fit the goofier tone. As someone who started shining during K-ON!, Kadowaki is often willing to let through charming loose drawings to begin with, but it’s during the second half that her delicacy shows; lots of care put into every movement, to the point you can feel hesitation, hurriedness, the struggle and the force of the wind just within seconds of a shot focusing on the legs alone. This kind of work sprinkled through the second half is what made her win over the likes of Horiguchi and Yamada. Overall the episode is still on the conservative side, a needed respite after the ridiculous production effort last week. 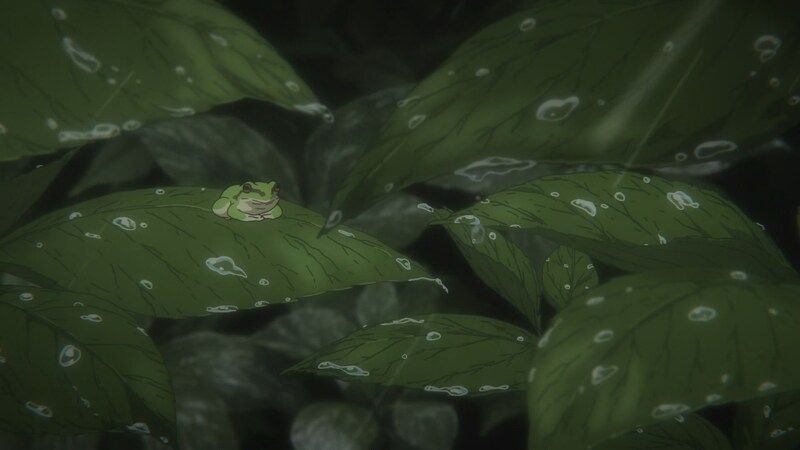 DO have produced some of the most impressive episodes at the studio – Hyouka #21 with Kadowaki also at helm of the animation always comes to mind – but in this case it seems like they were used as buffer between more ambitious animation efforts. The timing indicates we might have another episode by the Osaka branch of the studio before the end of the series, which might be their chance to show off with a spectacular showing. Not much to say about the key animation list this time around that I haven’t brought up already, so let’s end with that hopeful note. I was honestly expecting the episode after the concert to be rather mundane and extraneous for the studio to catch their breath and the story to calm down again, but it seems like we won’t get any boring or badly produced Hibike! 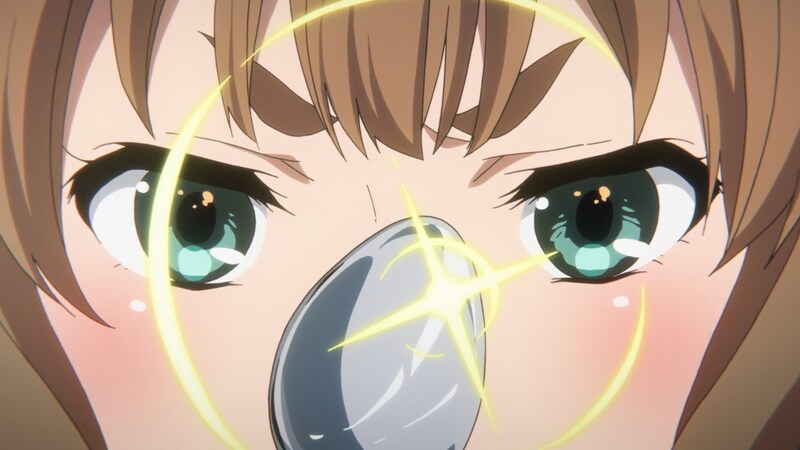 Euphonium 2 episode and that is really, really great. Also, as usual, nice write up! I noticed the color in the opening, but totally missed the reason. Fun fact: Eisaku Kawanami was trained to become a director by Mitsuyoshi Yoneda, the storyboarder/director of Episodes 4 and 10 of Nichijou, before he retired from the industry. Kawanami served as Yoneda’s assistant on those episodes before making his official debut with Episode 21. Many years later I’m still sad Yoneda flat out vanished from the industry forever! I still don’t know why Yoneda decided to leave the animation industry. I haven’t heard anything from him since Nichijou Episode 10. He was a valuable asset to Animation Do, having been an animation director for several years, before becoming a storyboarder/episode director with Clannad. At least IMO, Kawanami has proved to be a more than adequate successor of sorts. By the way, I can’t wait to see what you’re going to say about Episode 7, since Haruka Fujita is storyboarding and directing the episode. I’m really looking forward to her work, since it’ll be her first chance this season to show off by herself (aside from the ending of course). I’m sure Fujita will do a great job with her episode. Though we might not have another Season 1 Episode 8, but I think it’ll be close. She just keeps improving her craft IMO.